Lightning struck twice in St Helens, Merseyside, where Catherine Render, 39, and her nine-year-old daughter Sophie, have both battled cancer and come through. Catching up with them after an ordinary school day, you would never now guess that anything was ever amiss in this upbeat home where Sophie cuddles her pet rabbit Fluffy, little brother Jack plays trains and Catherine makes tea whilst finalising plans for her first attempt at the Great North Run. Her parents Anne and Sid are on hand to help out, smiling with relief and pride. Like Catherine’s husband Eddie, they too have viewed the past six years as a whole-family fight for survival and recovery. Sophie was diagnosed with acute lymphoblastic leukaemia (ALL) at three. In remission at five, she pulled through near-fatal meningitis only to relapse and require a bone marrow transplant without which her chance of survival was rated only 30 per cent. Happily, Jack was found to be the perfect donor. But the day before Sophie’s sixth birthday Catherine was diagnosed with breast cancer, which twice recurred. Perhaps due to stress which he struggled to hide, Eddie too fell ill, suffering a stroke just before the family left for a dream trip to Disneyland. He’s now fully recovered. Here Catherine tells how Sophie’s positive attitude inspired her too. She tells how just a few optimistic words from the medics kept them all going when hopes ran low. "How have we got through? We’ve laughed a lot; we take one day at a time and we really value the good times" she says. It’s small wonder that the local press has dubbed this brave, resilient family the "Mersey Marvels". It was a very tough time as Sophie faced two years of treatment starting with three intensive bouts of chemo with daunarubicin and cyclophosphamide. After the first six months she had another 18 months of more gentle, oral chemo with an extra dose of methotrexate given into her spine ever 12 weeks. I had to divide myself between Sophie who needed me in hospital and Jack whose little life needed to continue too. He’s had a rough ride too, never having known anything but a life with illness in the family. Sometimes he slept in a different bed three nights running - at home with Eddie, then with Mum and Dad and then in the Ronald McDonald House for families with sick children, close to Alder Hey. Ronald McDonald was an absolute godsend - somewhere calm in the mist of chaos where I could go just to have a bath, cook a meal or watch telly with Sophie when she was able to leave the ward. Sophie’s consultant paediatric haematologist Mark Caswell was always a source of tremendous strength to us: he manages to tell you the truth, yet drops in enough good news so that you are not utterly dejected. He explained that Sophie’s age and the fact that she was a girl were both in her favour and that the success rate for ALL was up in the eighties. 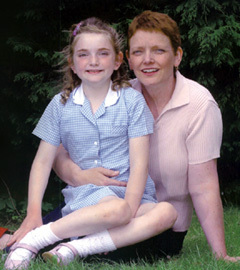 We felt hopeful until right at the end of the two years when, in 2000, Sophie collapsed at home. She had developed the HIB virus (which is a form of meningitis), along with septicaemia. She was rushed to the ICU for five critical days and this time not even Mr Caswell found a positive word to say. Even he feared we were losing her as she had nothing left to fight with. Eddie and I seemed to go to pieces by turns, with the other one somehow staying upbeat. As a hospital Alder Hey has taken a lot of flak for removing infant organs, but to us they are beyond praise - they couldn’t do enough for Sophie. One consultant sat by her bed for a 23 hour stretch. He should have come with a white charger! One night Sophie took a funny turn: her pupils dilated and she didn’t know me. An emergency CAT scan revealed that candida - a fungal infection - had colonised her brain and a specialist reviewing the scan said she couldn’t understand how this patient was still alive. Sophie was started on two very strong anti-fungal medicines but all night I thought she could close her eyes and that would be it. The next morning I woke from a brief nap to find the nurses were gathered round the door marvelling that Sophie was back with us and talking. She was too weak to lift her head; her legs were in splints, but very slowly she improved. All through that time we had talked to her, told her stories or sung to her - songs like Go to Sleep my Baby which she still loves now. I kept telling her that if she only got better I’d take her to the toyshop and she could have anything she wanted! The S Club 7 song Don’t Stop, Never Give Up should really be her theme tune, because we put her recovery down to her extraordinary stubbornness and strong will. She has been truly incredible. For a year, at five Sophie was clear and we sort of got back to normal, even taking a trip to Disneyland Paris thanks to the Starlight Foundation. Then, almost a year to the day after her treatment ended. Blood tests showed that Sophie had relapsed -though at least Mr Caswell said they had caught it early. There was now a question mark over the treatment choice: if Sophie had relapsed after a year she would have had more chemo, whereas under a year they would try a bone marrow transplant. With Sophie at precisely a year they decided to test us all as bone marrow donors. When Jack came back a perfect match that seemed to clinch the way forward. But should a healthy three-year-old boy risk an operation and blood transfusion? Ultimately this decision wasn’t up to us. Mr Caswell put the case to up to the hospital’s Child’s Rights Advisory Forum, pointing out that if something happened to Sophie and Jack later found out that he could have helped and didn’t, that too could be damaging. We ourselves had no hesitation in giving the go-ahead, because that’s the way our family functions. If my brothers ever needed anything off me they could have it - and I know they’d do the same for me. I opted to have fairly heavy chemo - epirubicin and CMF - before having a mastectomy in January 2002. This way round Sophie’s transplant would be out of the way before I had surgery. I’d wanted to defer the chemo too, but my consultant stood firm. ’No’ he said, ’you are just as important. You have to come in.’ So I’d have my chemo at Whiston and then return to Alder Hey feeling awful. The nurses were brilliant and every night they found a bed for me next to Sophie. They even woke me at five am for an anti-sickness pill so I’d be OK to look after her in the morning. Only three people were allowed in with Sophie in the critical 17 post-transplant days, but for us they made an exception so that Eddie and my parents could help out if I was too poorly. Despite her low state beforehand Sophie was fantastic after the transplant, jumping on her bed and eating really well. Jack rallied quickly too and was soon back at nursery. Once I’d finished radiotherapy I thought ’this really must be it now’. But last year a rash on the mastectomy site signalled a return of the cancer. I was given Taxotere which made me ache all over and lose my hair again. It was then a case of keeping my head down, keeping going and trying to smile. This year, in February the lump returned and I was scheduled for a Diep flap - in which the surgeon cut away section after section which was quickly analysed until they reached unaffected flesh. Then another surgeon stepped in and reconstructed the breast from my stomach, so at least I got a free tummy tuck from this 11 hour operation! Six weeks later, whilst I was still recovering a mammogram on the right side - which had only recently been checked - now revealed a brand new cancer. So in May I was back in theatre for a lumpectomy. All in all I’ve had good experiences of treatment and others where you think ’Oh please give me something positive to take out of this room.’ Before the Diep flap one doctor said ’Oh, you’ve had nearly all the chemotherapy we’ve got. We don’t know what to give you next. If we give you another operation this would be a last resort.’ His words hit me like a brick wall. I then saw the Macmillan nurse who said ’You’ve had a lot of chemotherapy, but there are still things in the pot.’ Both had said exactly the same thing, but the nurse had given me something important to hold on to. I’m now still on oral chemo and now feeling positive. I try not to think of all the things that have befallen us all at once or to look too far into the future. I take vitamins A C and E and also acidopholus. We try to eat healthily and I drink a lot of water. I do yoga and have reiki with a wonderful local woman, Anne Russell who leaves me feeling really calm. I am lucky that I have no problems lifting my arms. I sometimes get tightness along the right arm, but with a little stretching it soon eases. My Mum had breast cancer 30 years ago (tests showed there was no genetic link with mine) and says the treatment then was caveman stuff. Now she’s nearly 70 and still going strong. I now recognise the look on other parents’ faces when they come into Alder Hey having obviously heard bad news. My dad always says to them ’It does get better’. Sophie - touching wood - is now completely in the clear, though she still takes prophylactic antibiotics as her immune system isn’t quite back up to normal. She’s just a very girly girl who loves her bike, the trampoline and her pink and lilac room which is Barbie Palace! I don’t think she’s really grasped the gravity of her illness: she just says ’I’ve had cancer and you’ve had it too Mum’ as though she was talking about an ingrown toenail. I am perhaps more protective of her than I might be had she not been ill: I’m fine while she’s fine, but she goes to bed early for a couple of nights, inevitably I think: ’oh dear’. ’We don’t want Sophie to be constantly thinking that Jack saved her life so she should be doing this or that for him. Only once when she complained that she hated him and wished he wasn’t her brother, did I say ’You know, he did a really good thing for you...’. She and Jack are close but they scrap like any other children. Over the last few years prayers have been said for Sophie and me all around the world from Liverpool to London, Boston in the USA and the Turks and Caicos Islands. Eddie’s sister’s neighbour knocked on the door of everyone in her street, regardless of religion, asking them to add their prayers or light a candle. The good that’s come out of our experience is that we appreciate good times so much more. Eddie’s hope is for a quiet life with no dramas, and my greatest ambition is to be a granny.